One of the biggest problems new pet owners face is how to stop their dog from peeing and pooping inside the house, especially at night times when you cannot keep an eye on him. Being a new pet owner, I had and it’s a nightmare. For pet keepers who have succeeded in teaching their dogs friendly manners, thumbs up to them; but for those who are still struggling to keep their houses clean, you have just came to the right place because in this article we will be discussing this issue in detail. I had read many different topics on why dogs pee at house and how we can prevent them from urinating inside. Continue reading this article to acquire effective techniques to stop your dog from peeing in the house at night. The following strategies can come in handy if your dog has a habit of peeing in the house at night. 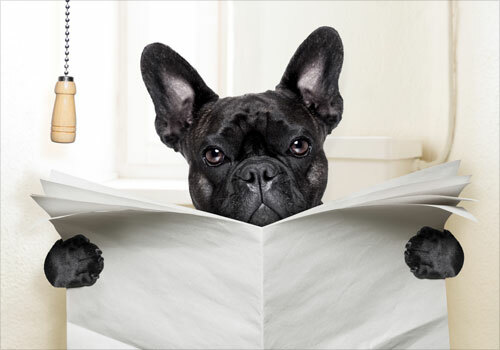 One of the leading causes of urination among most dogs is attributed to medical complications. Common medical problems such as Urinary Tract Infections and Bladder Ailments are to blame for frequent leakages from the bladder. With the assistance of a qualified veterinarian, these diseases can be treated. If such problems are handled appropriately, your dog could soon be able to hold urine for a relatively longer time. If your dog is untrained inside the house, this is where you need to be observant. When you can, monitor him/her by constantly looking out for signs of peeing. Otherwise, you should crate him when you are leaving him in the house alone. 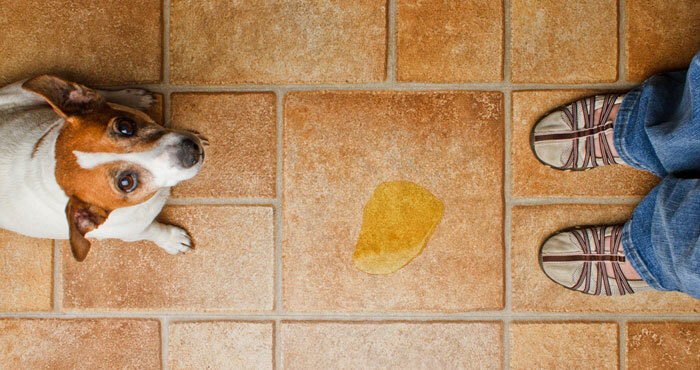 Most dogs are likely to pee in the house if they are left in the house unaccompanied. On the other hand, you are likely to notice the signs when he wants to go out if you give him company. If you see him sniffing, wandering or pacing, you should show him the way out immediately, to prevent him from peeing in the house. 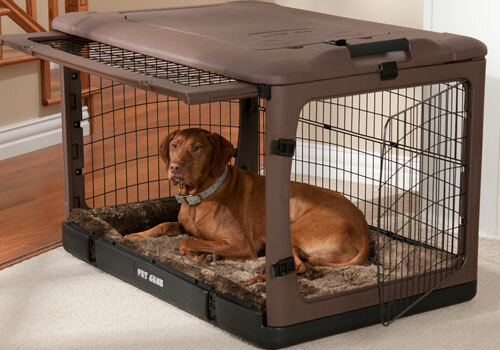 For a new dog, learning how to use the crate can be a tall order, but with time, he can adjust to this new way of life. You can introduce your dog to the crate by throwing in a piece of meat or any of his favorite foods. 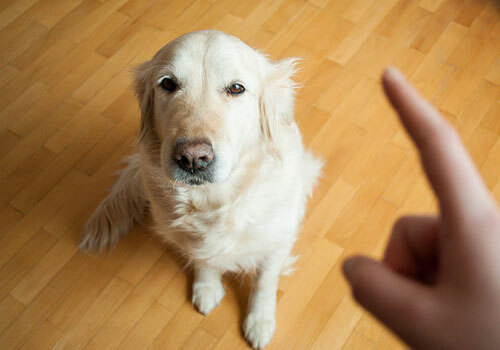 If this process is repeated, you should expect your dog to go into the crate on his own, with the expectation of receiving a couple of treats from you. If he does this, do not disappoint him; treat him with pleasantries every time he obeys your commands until he can adjust to this new way of life. If he succeeds in learning this trick, you won’t be seeing unpleasant habits anymore. When you get back from work, be sure he goes out for a few runs before he returns to the crate. Basically, most dogs have to go out after eating. You should always be conscious of this fact especially if your dog has kidney issues or bladder problems. Be sure to let your dog out and teach him to do the right thing. Let him know that all biological waste should be deposited of outside the house. The best way you can teach him this is by discouraging him every time he wants to pee inside the house. Some house domesticated adult dogs can use the toilet when trained appropriately. However, this process requires both time and patience. In fact, you may require the assistance of a pet trainer. In addition, you may have to start this training when your dog is still young enough so that by the time he is one year old, he will be able to use the bathroom by himself. Even so, you can use other strategies such as crating if your dog has bygone the recommended training age. There is no better way to enhance the health status of your dog than by having regular breaks and short drills. In this way, you will not only enhance the physical fitness of your dog, but you will also improve his general health status. Basically, healthy dogs can hold their urine for much longer, unlike unhealthy ones. With regular breaks and exercise, you can help your dog to minimize accidents and possibly avoid preventable kidney illnesses. One important and distinctive characteristic of dogs is that they appreciate counsel. If you clap loudly when your dog wants to pee in the house, he will stop immediately knowing that you disapprove of the behavior. If you proceed and lead him in the right way by showing him the way out, he will know for sure that he was wrong and may try to avoid the same mistake in the future. With such constant aid, he will learn good habits and respect your advice. However, you should be careful not to sound too harsh to your dog, in case he thinks you are being aggressive. If your dog becomes scared, accidents can occur. He may also develop unsuitable attitudes, such as running away, as well as other unfriendly manners, such as naughtiness and disobedience. You should always use enzymatic cleaners to digest any protein material contained in the urine so that your dog will not use the same spot again. Dogs detect their waste by smell and they are likely to return to the same place if the need arises. Get enzymatic cleaners and paper towels from any pet store if your dog is fond of this disagreeable habit. In addition, you may also need a deodorizer to eliminate bad scents that may encourage your dog to revisit the same spot. Clean carpets using deodorizers and allow them to dry completely. When it comes to puppies, additional precautions should be taken to avoid peeing inside the house at night. For instance, puppies should be led out as a matter of urgency after dinner. This habit should also be encouraged among adult dogs, since a lot of urine is accumulated overnight. In fact, studies have shown that most dogs pee in the house at night. Since you now know the solution, you can start eliminating the problem. It is important to maintain a constant diet for your dog. 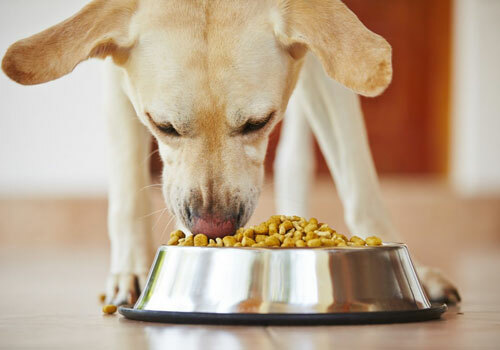 Normal commercial dog diets such as kibbles may take up to 15 hours before waste is produced. This means your dog can stay in the house for much longer without necessarily going outside. On the other hand, all-natural diets can take up to 6 or less hours before waste is produced. However, if the dog’s diet is frequently changed, the digestive system may also vary. Such variations can be disadvantageous, especially to you as a keeper. You should keep your dog maintained on a diet that you can manage to avoid inconveniences such as peeing in your house. What’s more, the hard job is nearly done. You now have the strategies at your fingertips. If you implement the above strategies, you can stop your dog from peeing and pooping in the house. How to Stop Dog From Eating Poop? Why Do Dogs Eat Poop? I find a great way to cope with the peeing problem is to use doggie diapers or belly bands on our dog. Dogs tend not to mark when they wear diapers, so they can be trained not to mark inside the house unless taken outside. Appreciate the feedback, Ashley. Doggie diapers can be a good solution for stubborn dogs. Anyone knows where to get dog diapers? We love our 3 yr old rescue dog. We’ve had him 7 months, and he hates peeing outside in the yard, especially if it’s raining. He will pee on our deck or porch. Not ok! We have a nice large yard. He even will sneak back inside through the doggie door at night and pee on the kitchen table. We’ve never caught him doing this, and find it the next morning or a day later. What can we do? He’s in a crate when we’re not home due to destructive behavior, like chewing on our leather couch. HELP! We already suggested several tips in the article. Try them, and if nothing works, you can use dog diapers too, as some suggested they works great. Hi! Could use some advice. My 8 year old dog goes through fazes for peeing in the house at night and has since we got her 6 1/2 years ago. Only little pees on carpet while we sleep. Never tile – she always finds a way and even when we shut all the doors she will go in our bedroom. We make sure she goes before bed and she can hold her pee all day while we are at work. Never had a daytime incident (no access to dog door). It feel like she does it on purpose because the spots are very small and often only after a couple hours of going outside. She has never been crated and I worry about crating her at such a late stage in her life. Also not medical because she is in good health and we know it is behavioral since no issues during the day. She is a small anxious, and sweet, dog. Any advice? We are at our wits end and started even giving her treats at night after she goes to the bathroom like a puppy but stepped in a small pee pile this morning. Following: I need the answer to this exact issue with 9yr old dog. She’s a little beagle and sweet as can be, rehomed her with us from my sister whose had her since she was born. She only pees at night and only on capet, not a lot, and appears behavioral. forgot to mention, she did this with my sister too. I would love to come up with a solution other than crating at night. We already mentioned solutions in this article. Try them and if nothing works then use a crate. This was overall a very informative article, very helpful. Thanks.